Learn more about ACRL Vice-President/President-Elect candidates Jon E. Cawthorne and Anne Marie Casey in a new online recording. 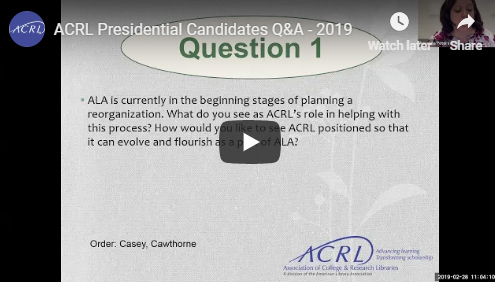 Cawthorne and Casey respond to questions prepared by the ACRL Leadership Recruitment and Nominations Committee (LRNC) and discuss their platforms and vision for ACRL. Moderated by LRNC Chair Amanda Peters, the session lasts approximately 30 minutes. Cawthorne is the Dean of the Wayne State University Library System, including the School of Information Sciences; and Casey is the Director of the Hunt Library at Embry-Riddle Aeronautical University. More information on the 2019 ACRL election, including links to candidate statements from C&RL News and a full slate of candidates for ACRL section offices, is available on the ACRL website. Voting in the 2019 ALA/ ACRL election begins on March 11. We strongly encourage you to help shape the future of your association by casting a ballot for the candidates of your choice!